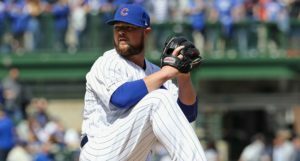 Given the sudden decrease in walks for Jose Quintana, the upward trend of Kyle Hendricks, the welcomed appearance of “Big Jon Lester” last night, and apparent steadiness of Cole Hamels, I was beginning to think the rotation was taking that much-needed step forward and at just the right time. 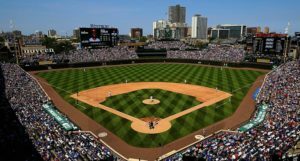 Heck, with Yu Darvish possibly returning in a couple of weeks, the Cubs might soon have an abundance of riches! Currently a Cubs starting pitcher but having just swung into the bullpen for a bit because he can, Mike Montgomery is hitting the disabled list with left shoulder inflammation (joint inflammation seems to be the injury of choice for Cubs players this season). It’s a big bummer for Montgomery, whose last start was absolutely excellent (6.0 IP, 5H, 0ER, 2BB, 4K). I’m guessing, given the nature of the injury and his elevated inning count, that this was more of a long-time-coming type thing, but I can’t help but point out that it came after he was moved to the bullpen for a single start. He probably would’ve throw a side session anyway, but I just hope (and don’t really think, to be sure) getting off his rhythm wasn’t part of the cause. Montgomery said had felt discomfort but "thought it was normal soreness," then gave it a day but it hadn't cleared. "I was kind of shocked. I thought I'd go out there and it'd be fine." Montgomery certainly sounds optimistic that this will be a short-term issue, but I don’t think we ever know quite this close to the injury. Shoulders are scary. In any case, he will not be starting tomorrow as scheduled, as former fifth-starter Tyler Chatwood will take his place. In his three appearances since moving to the bullpen (5.2 IP), Chatwood has allowed 4 earned runs, 5 walks, and 3Ks. So there’s not much reason to expect something to change. At least he’s already right there on the roster though, I guess. Speaking of the roster, Montgomery last pitched on August 11th, but the Cubs can’t back-date his DL stint that far. The most they can do is the 14th, making him eligible to return with about a week to go before rosters expand on September 1st. Randy Rosario will come up in the meantime, but after that, things can get messy. 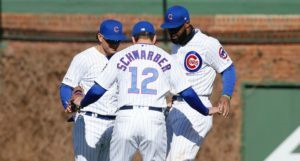 If the Cubs wait to activate Montgomery until September 1, he might have to head straight back into the bullpen, along with Chatwood, to make room for Darvish (who’s throwing his first rehab start this Sunday (more on that in a bit)). If that’s the case, we may have seen Montgomery’s last start for the Cubs this year (that is, unless they want to roll with a six-man rotation to give everyone a little rest before October). Then again, if it’s not too serious of an injury and the timing before tomorrow’s game played a role, Montgomery can always return for a start before September 1st, as soon as he’s eligible. But that’s the gist of it for now: Montgomery to the DL, Rosario to the bullpen, Tyler Chatwood to the rotation.